After 22 hours of travel, we have finally arrived in Italy. It is a dream come true! I have wanted to visit Italy for as long as I can remember. The flight was uneventful. I wouldn’t say pleasant, because it was so very long and I tend to feel a bit claustrophobic after a while. And covered in germs. But I will share a bit of advice about long flights. Are you ready? I mean this advice is insightful and will change your life. Ok, maybe not. But it will keep you from puffy, painful feet. Purchase some travel socks and wear them for the flight. These socks are expensive, about $30 a pair. But I will never have to buy another pair, and they do make an amazing difference. 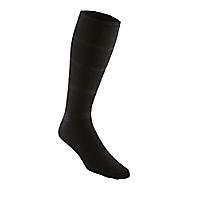 They are heavy duty compression socks that go up to the knee. Did I mention how attractive they are? Ok, not so much. But who cares? It will prevent you from wearing sassy sandals and a skirt, but they will insure that you can wear sassy sandals and a skirt when you arrive since your feet will not be twice their normal size. Compression socks will encourage healthy circulation and even helps prevent blood clots. Not that I am truly worried about blood clots at this point. It is really more of a comfort/vanity thing. I purchased my travel socks from Travelsmith.com. They are also available on Amazon. Some people just use compression socks they get at their local pharmacy, as many diabetics need to wear them on a daily basis. I like how my travel socks go up to the knee and stay there. They can be a bit hot, but since I am always freezing on airplanes this works out great for me. So there. A bit of travel advice you have been waiting for.